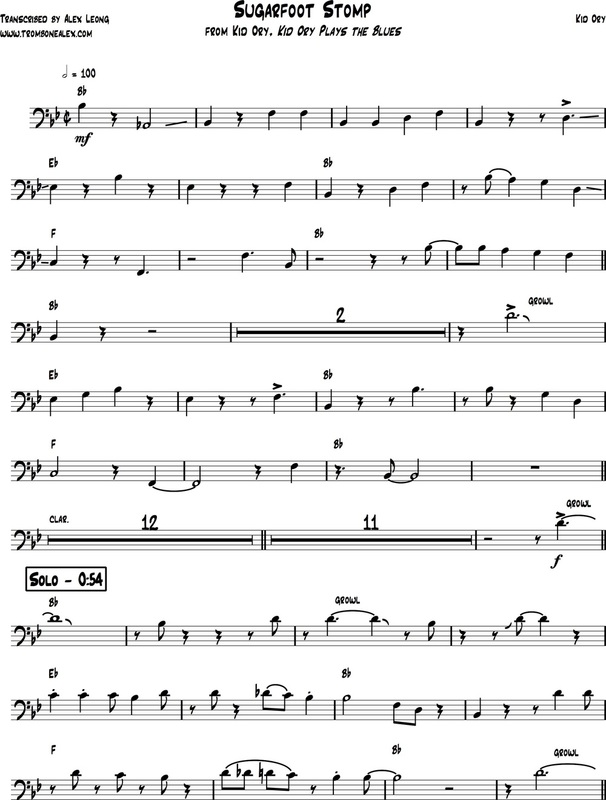 Sugarfoot Stomp (PDF) from Kid Ory, Kid Ory Plays the Blues. The jazz tradition in four parts... and you won't believe what Coltrane substituted for #2! Improvisation - Often disregarded by the casual listener as the act of throwing away the rule book, it has been mistaken for an invitation to make careless noise. However, the beauty of practiced improvisation is the spontaneity to the moment, the ebb and flow of musicians listening and reacting to each other, as if they were having a passionate argument of expletives. Orchestration - The separation between the classical orchestra and the jazz big band disappeared during the Twentieth century because both ensembles made use of the number and variety of musical voices. Yet the same principles are also utilized in the jazz-tet setting, from how a melody is passed around to the re-harmonization of a voicing, the creativity lies in the attempt to expand the limitations. Technicality - Likewise, the Creative jazz musician attempts to expand the physical limitations of their instrument, often making discoveries through improvisation. But musical mastery is not always won by the fastest or furthest-out musician. The technically-apt musicians also understand how to hold back to play a slow ballad. Rhythm & Blues - The swing feel is rarely notated in the classical tradition, it generally is an implied feeling. And how hard it swings depends on how bluesy that feeling is. Perhaps this is jazz's most significant contribution to Western music, the feeling resonates deeper than the theory. A re-working of "Dippermouth Blues," this recording of the "Sugarfoot Stomp" naturally incorporates these four traditions. The use of improvisation is apparent throughout the featured solo passages, yet the supporting melodic voices also improvise their parts throughout the tune based on rhythmic or harmonic patterns. These proven patterns fulfill the larger idea of orchestration: an ostinato pattern outlines the harmony while a walking or sliding bassline defines the chord changes. And orchestration also includes how the tune is arranged, such as the use of breaks and shouts to give the music life and energy. The "hot" rhythmic tempo of the music shows off a the technicality of a well-rehearsed group, able to fly through the entire tune in under three minutes with precision and feeling. Even though Kid Ory's trombone solo does not venture far out and also reuses multiple patterns, his growls and punchy smears reflect a primal bluesy feeling that employs these four jazz traditions. Here is YouTube video of Fletcher Henderson's group playing "Sugarfoot Stomp" featuring Louis Armstrong on cornet. Recommended Reading: How to Write a Novella In 24 Hours: And other questionable & possibly insane advice on creativity for writers by Andrew Mayne. Kindle Edition.